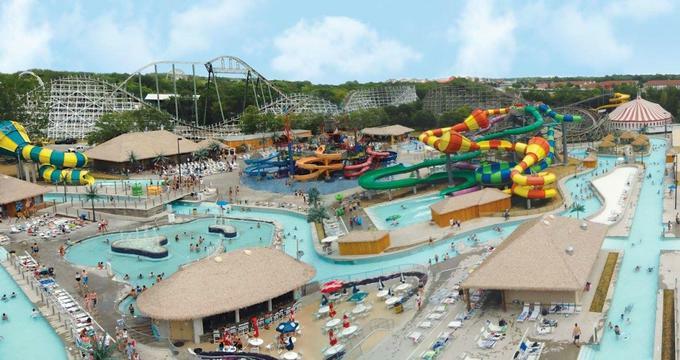 Located in Altoona, Iowa (east of Des Moines), Adventureland Resort is now the largest tourist attraction in the state. Featuring over 100 different attractions, rides and shows, it offers something for everyone no matter their age or adventure level. After a tornado delayed the original opening day of Adventureland Resort, it was finally able to open in August of 1974. The first full season, however, wasn’t until 1975. Built on the Des Moines Airport grounds where Charles Lindbergh once landed, Adventureland Resort has grown substantially from a handful of rides (including an original ride from the World’s Fair in Spokane - the Skyride) to a 180 acre full resort with plentiful food options, many fun games, an inn and a waterpark. Owned and operated by the Krantz family (longtime CEO Jan Krantz passed away in 2013), this resort has also featured one of the top 10 wooden roller coasters in the world (the ironically named Tornado). Another major part of Adventureland Resort’s history is their mascot, Bernie Bernard. This saint bernard greets guests and helps find them find their way through the park as he is on the resort’s maps and signs. Adventureland Resort features permanent attractions in four categories : Adventure Bay, Family Rides, Kiddie Rides and Thrill Rides. Adventure Bay: Adventure Bay is the water park section of the resort and it truly has something for everyone. For the thrill seekers, there are the Bermuda Quadrangle, the Gang Plank, the Pirate Plummet, the Reef Racer and the Typhoon water slides, each adrenaline inducing in their own way! For those who like to relax, Adventure Bay features the Caribbean Cruiser (their lazy river) and the Pirates’ Port Pool. For the family, there is Kokomo Kove and Heron Harbor, both very child friendly. Breaker Beach Wavepool is also a favorite attraction that everyone can enjoy! Family Rides: There are a large selection of rides for the whole family to enjoy at Adventureland Resort. The A-Train, the Giant Sky Wheel and the Sky Ride are transportation based for those looking for a calm ride with the whole family, while the Raging River and Saw Mill Splash are water based and more thrilling rides. Somewhere in the middle are Balloon Race, Carousel, Der Flinger, Frantic Freeway (bumper cars), G-Force, Galleon, Lady Luck, Lighthouse, Teacups, Tilt-A-Whirl and the Underground (a haunted attraction). Kiddie Rides: For families with smaller children, Adventureland Resort has a wide variety of kiddie ride options. There is the Chuckwagon, Convoy, Frog Hopper, Hampton Cars, Infant Ocean, Lady Bugs, Puff Dragons and Red Barons, all great options to let the kids have just as much fun as the adults. Thrill Rides: One of the biggest attractions for adrenaline junkies, there are plenty of rides for every taste at the resort. For those wanting traditional roller coasters, there is Dragon, The Monster, Outlaw and Tornado. For non-roller coaster enthusiasts, there is the Falling Star, Himalaya, Sidewinder, Space Shot, Splash Over and The Storm Chaser. All are guaranteed to get the adrenaline pumping! Adventureland Resort likes to keep it fun and exciting! Recently, the resort started an annual Oktoberfest event. This one- day event offers beer, multiple food vendors and access to a limited number of rides for an additional charge. They also offer fireworks during 4th of July, military promotions for Memorial Day, “dry” days (no beer is sold in the park) in conjunction with the local D.A.R.E. programs, and arts and craft fairs on Main Street during the off season. Local school bands are also invited to play in the park the first few weekends of the open season. Besides the special events, the 25,000 square foot facilities are also available to rent out for conferences, group events, receptions, reunions, and weddings, complete with optional catering and access to their staff. Guests can also reserve picnic space at any of the resort’s five parks, which is a great outside area to host large gatherings and family reunions. There are plentiful dining options while at Adventureland Resort, including many food stands and full restaurants in different styles and cuisines. Visitors are also able to purchase alcohol on premises. No outside food is allowed inside the park; however, guests may bring in bottled water or sports drinks. No soda or energy drinks are allowed in. There are also areas to picnic outside of the main gates. There are also a few gift shops to visit while at the park, where guests can purchase clothing, toys and pictures to remember the visit.